BrigGen R. Thomas Browning, USAF Ret. 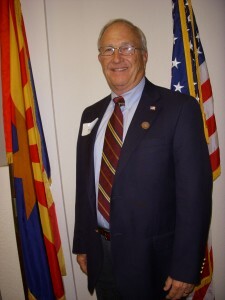 One member of the Arizona Chapter MOAA was inducted into the Arizona Veterans Hall of Fame at the eighth annual induction ceremony on October 25, 2008 at the El Zaribah Shrine Auditorium, Phoenix, AZ. The Arizona Chapter is proud to count one of the inducted members of the Class of 2008 as a member of our Chapter. BrigGen R. Thomas Browning, USAF (Ret), was inducted, along with 19 other new Hall of Fame members at a luncheon with over 500 people in attendance. BrigGen Browning joins 12 previous inductees from the AZ Chapter of MOAA in this prestigious organization. The Veterans so honored have honorably served their country through military service and have continued to serve and inspire their fellow man with deeds and accomplishments throughout their lifetime. The Class of 2008 brings the total number of Arizona Chapter MOAA inductees in the Arizona Veterans Hall of Fame to 14.